But will this cause massive delays? In an effort to slow down its worst pollution crisis in 10 years, Paris is making all public transportation free for the second straight day. People are being encouraged and required to leave their cars at home and hop on buses and the subway at no charge. The government believes such a bold measure is necessary to deal with the smog-filled air and is prepared to extend it for many more days. “As long as the meteorological situation remains the same and emissions remain the same, we will not see the end of the pollution spike,” said Michel Cadot, the Paris prefect. Paris city has imposed an odd-even license plate system — only odd numbered plates can drive on one day, and only evens on the next. On Wednesday, odd-numbered cars have the road. Any violators will be fined — 1,700 drivers were fined in this way on Tuesday. This alternating-day tactic is common for cities struggling with sustained spikes in air pollution and has been enacted in Mexico City, New Delhi, and Beijing. But for city-dwellers around the world, the idea of free mass-transit is enticing and could, in fact, be a long-term remedy for air pollution. Cities all around the world, especially throughout Latin America, are rolling out versions of this strategy, while substantially improving public transit in the process. Of course, the immediate flooding of transit system could lead to severe overcrowding and delays, ultimately deterring people from traveling in this way. So Paris is deploying more buses and trains to deal with the influx. 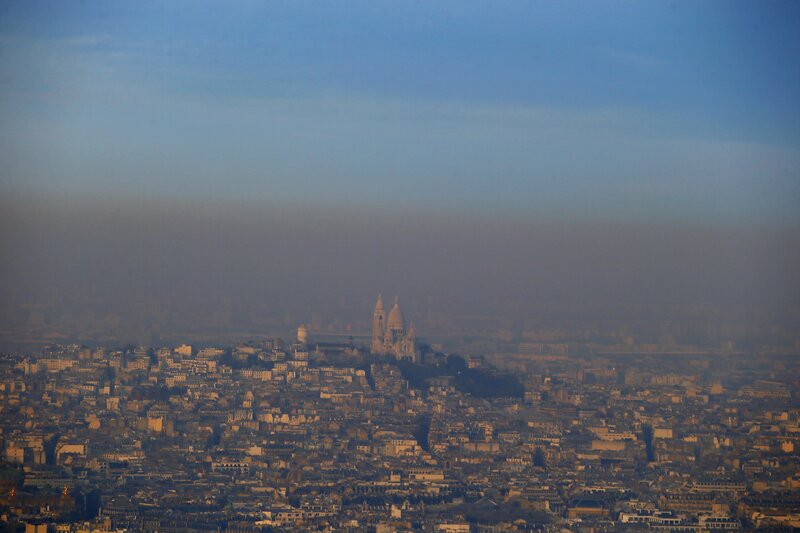 The air in Paris has become so toxic because of excessive car use, wood burning, and, perhaps most importantly, because there is little wind circulating in the city to disperse the pollution. The air is just sitting there, stagnant, getting heavier with contaminants by the hour. The Parisian government understands that air pollution is not going away on its own and is taking steps to fundamentally reorganize the city. The city is part of a progressive cabal of cities tackling climate change. Public transit is one of the core pillars of this movement. By 2025, all diesel vehicles will be banned in the city. “Mayors have already stood up to say that climate change is one of the greatest challenges we face,” said the mayor of Paris Anne Hidalgo at the C40 conference of mayors on climate change.